Today, as you travel along the Oregon coast, you will probably notice a tall, kilted gent with his two fluffy companions (Hudson & Indiana) heading south. Luke Robinson just left Newport’s LaQuinta Inn and is pushing onward to raise awareness for canine cancer one mile, one city, and one person at a time. After losing his dog Malcolm to cancer, Luke Robinson had a vision of raising awareness and funds for canine cancer research. He started the charity Two Million Dogs to accomplish this goal and then embarked on long distance walks to raise awareness. In 2008, Luke walked from Austin, TX, to Boston, MA. This summer Luke and his two dogs are walking from Canada to Mexico. They will be journaling their experience and posting updates as they pass from town to town on their journey for cancer awareness. 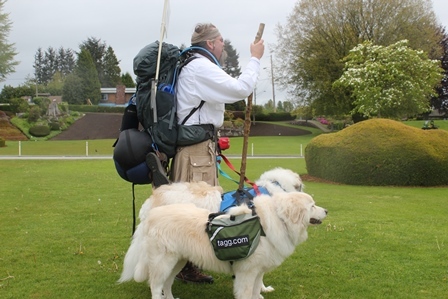 On May 10th, Robinson started his second walk from the Canadian Border to the Mexican Border to continue his mission and to honor Murphy, the second dog he lost to cancer. Hudson and Indiana are Great Pyrenees who will be accompanying Luke on his journey down the West Coast. Tagg the Pet Tracker is proud to have outfited them with GPS trackers and customized carry packs for their journey. 2 Million Dogs / Puppy Up was formed on the belief that if 2 dogs can walk 2000 miles to bring awareness to cancer surely 2 million dogs can walk 2 miles and spread awareness in their own communities. Click here to read more about Puppy Up, see photos and to track their progress to Mexico.